Something about them strikes nearly everyone as repellent. Cave crickets seem badly in need of some public relations assistance. 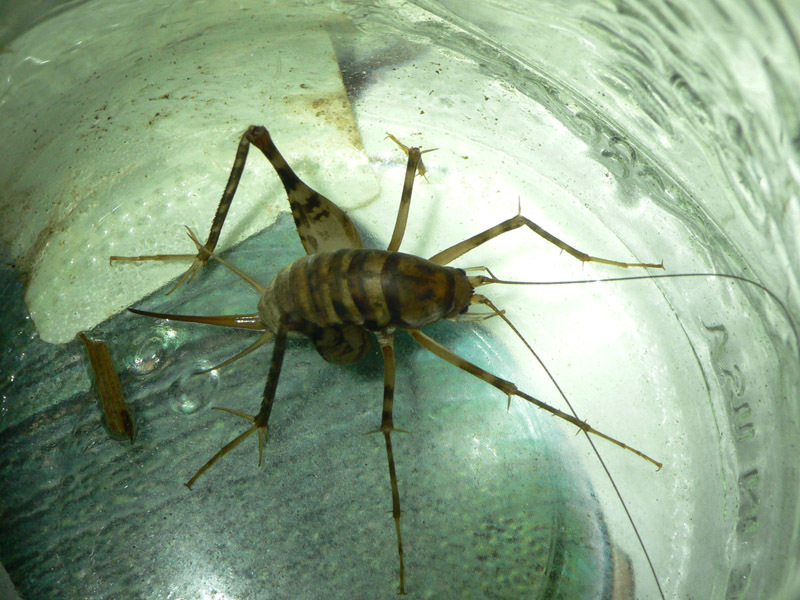 Gawky, humpbacked insects (camel cricket is another common name), ranging up to nearly an inch in body length, the cave cricket family is actually closer to the katydids than to the true crickets. Something about the look of these insects seems to strike nearly everyone as repellent. And their light-shunning habits and preference for dampness endear them to no one. So naturally I invited one into my home. Knowing that I’d love to study cave crickets, something I’ve never personally seen except in the form of pinned specimens, my colleagues Liz Loucks and Nick Petz brought me a mature female “greenhouse cave cricket,” Diestrammena asynamora, that they caught in the basement of a Nature Conservancy building in West Tisbury. First, it’s worth noting that the greenhouse cave cricket is a non-native species, introduced (probably many times) to the Eastern United States from its native range in Southern and Eastern Asia. (The Vineyard actually does have at least one native cave cricket, though it’s rarely encountered.) How Diestrammena got to the Vineyard is anybody’s guess, but I expect they were imported here accidentally on many occasions, delivered from one basement to another by people bringing boxes to the Vineyard. Diestrammena appears to associate very closely with humans, on the Vineyard and elsewhere; all the ones I’ve heard of were found in basements. This group of insects is so adapted for life in the dark that it has pretty much given up on having eyes; on mine, these organs are reduced to tiny black dots. In small numbers, cave crickets do no harm, and may help keep things clean by foraging on organic detritus — dead insects, cobwebs, crumbly paper. I’ve heard stories, though, of cave crickets congregating in basements in very large numbers — the phrase “like the wall (or floor) was moving” keeps coming up! — and this exotic species is not one that I would go out of my way to encourage. Still, I’m enjoying the lovely one that Liz and Nick caught for me. I’ve rigged up a gallon-size pickle jar as cricket habitat, with a layer of sterilized soil, a pile of rocks, some random vegetation plucked from the lawn, and cheesecloth stretched across the mouth of the jar. I provide a shallow dish of water and an upside-down bottle cap full of crushed cat kibble. I expect I’ll offer her a dead fly if I procure one. Looking like a cross between a shrimp and a katydid, Diestrammena has prodigious hind legs equipped with a few large, movable spines; these spines appear to be at least as much to aid climbing as for defense. In addition to the regular insect complement of three pairs of legs, Diestrammena’s palps — appendages next to the mouth — are elongated and prehensile enough to almost qualify as a fourth pair. My cricket, being a female, has a prominent, bladelike ovipositor on her stern, a device for inserting eggs into whatever cave crickets lay their eggs in. When my Diestrammena moved into the jar, her first order of business was epic grooming: For more than an hour, she ran her legs over her body, and over each other. Wrapping one of those long palps around the base of one of her tremendous, threadlike antennae, she bowed the antenna out into a loop in front of her as she ran it through the palp’s grip. It looked like she ate most of whatever she scraped off herself. In late afternoon, as it’s getting dark, my Diestrammena rouses into action, carefully exploring her little habitat and then applying herself to the cat kibble. When she’s eating, her antenna wag just a little bit, and it’s easy to imagine that she’s feeling contented. Diestrammena, though able to jump like a cannonball, actually moves slowly and deliberately most of the time, and a circuit around the inside of her pickle jar takes several minutes. Wherever she ambles, her exquisite antennae are active out in front, “smelling” the insect’s surroundings; these organs compensate for poor eyesight. Those palps, too, lead the way, feeling or tasting whatever is immediately in front of the cricket as she moves. During the daylight hours, though, my Diestrammena just sits — sometimes exposed on a leaf or tuft of grass, sometimes hanging upside down from the cheesecloth, sometimes tucked down in the vegetation in the jar. She’s much less interested in staying concealed than one might expect for a cave-dwelling scavenger, showing no interest in the little cavern I made for her from stones, or in hiding underneath dead leaves. I don’t know how well the behavior of my Diestrammena reflects the habits of this insect in its “natural” basement habitat. But given its subdued personality, Diestrammena seems unlikely to become America’s Favorite Pet. Mainly nocturnal, living in a world of touch and scent rather than vision, these are hard creatures for humans to feel affection for. Still, mine is a clean, docile animal, well adapted to a slow-paced life in near darkness. She moves her unusual body with a certain stately grace. I’ve enjoyed getting to know her. Next articleDo you hear what I hear?